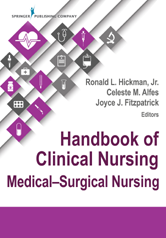 Editor/Author Fitzpatrick, Joyce, Hickman, Ronald and Alfes, Celeste M.
Designed for recently graduated RNs and nurses transitioning to a new clinical area, this extensive clinical reference is the best resource to provide essential information to nurses working on the med-surg unit. Concise and practical entries provide fundamental coverage of the most common clinical problems and issues encountered in nursing practice today. Atelectasis - Foreman Ashley L.
Bowel Obstruction - Lynn Kelly Ann and Marek Jane F.
Brain Tumors - Cebull Peter J.
Cardiomyopathy - Jolade Elsie A. Chronic Obstructive Pulmonary Disease - Canfield Christina M.
Colorectal Cancer - Masina Visnja Maria and Floruta Crina V.
Cushing Syndrome - Flenoury Yolanda and Marek Jane F.
Deep Vein Thrombosis - McConnell Kelly K.
Diabetes Insipidus - Diemer Danielle M.
Endocarditis - Donahue Courtney G. and Alfes Celeste M.
Fractures - Perazzo Joseph D.
Gastric Cancer - Hopkins Una and Marek Jane F.
Gastritis - Smisek Maria G.
Gout - Mendoza Maria A.
Heparin-Induced Thrombocytopenia - Idemoto Bette K. and Marek Jane F.
Hiatal Hernia - Gomez Maricar P.
Hypothyroidism - Terry Karen L.
Leukemia - Cortese Marisa A.
Liver Cancer - Rives Shannon A.
Lymphoma - Cortese Marisa A. and Marek Jane F.
Osteomyelitis - Variath Mary and Marek Jane F.
Osteoporosis - Mendoza Maria A.
Pancreatic Cancer - Millman Jennifer E.
Parkinson's Disease - Cebull Peter J.
Peptic Ulcer Disease - Ericson Lisa D. and Gillum Deborah R.
Peripheral Artery Disease - Petty Gayle M.
Prostate Cancer - Discenza Erin H.
Rheumatoid Arthritis - Brindisi Susan V.
Sickle Cell Disease - Albright Consuela A. Sleep Apnea - Cantero Deborah H., Lockett Leslie J., and Lutz Rebecca M.
Spinal Stenosis and Disc Herniation - Collier Steven R.
Systemic Lupus Erythematosus - Dorsainvil Merlyn A.
Thrombocytopenia - Mendoza Maria A. Tuberculosis - Canfield Christina M.